The re-shuffle of the Scottish Government cabinet won’t solve Sturgeon’s dilemma of when to use the parliamentary mandate in the Scots parliament for Scottish Independence. “Nicola Sturgeon and the SNP are caught firmly on the horns of a dilemma – ie when to use the majority parliamentary mandate in Holyrood in a new Scottish independence referendum – or run the risk of this mandate expiring in the melee of either a ‘hard’ Brexit and/or a snap UK general election, or both. “If Sturgeon passively sits and waits for Mrs May to decide ‘when the time is right’ for a new Scottish Independence referendum – in the context of the Brexit referendum where Scotland voted to remain in the EU – then that time will never come. “And if there is a snap UK general election in Autumn 2018 or even in Spring 2019 – Sturgeon’s mandate for a new Scottish Independence referendum will expire worthless. “The primary goal – and number one objective in the constitution of Scotland’s Independence Referendum Party – is to achieve political Independence for Scotland. “We aim to do so by helping to bring about a new/ second Scottish Independence Referendum in light of the entirely-changed political and constitutional landscape following the UK Brexit vote. “We shall do this by providing a meaningful, valid, SECOND choice/ chance to vote for Independence-supporting MSPs in elections to the next Scottish Parliament; ie SNP party members/ voters can vote ‘first’ choice for SNP on the ballot paper, and then vote ‘second’ choice for Scotland’s Independence Referendum Party on the ballot paper. “This gives two choices/ chances/ votes in favour of Scotland’s Independence (instead of the present 1/ SNP – and reduces the ‘stray’/ use-less ‘second’ vote going to any other British Unionist party. “Despite the use of the word ‘Scottish’ in front of their names, the Liberals, Tories and Labour are all single, British Unionist parties and are all controlled from, and based in, their London head offices. The SNP is divided over an unenviable choice. 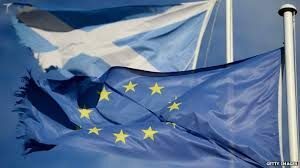 Announce the date of a second referendum, knowing a defeat would be a near fatal blow to the main aim of the party – or wait and potentially lose the chance for years to come in the likely event that the Scottish parliament’s pro-independence majority is overturned in the 2021 election.